Director – Samuel Bayer, Screenplay – Eric Heisserer & Wesley Strick, Story – Wesley Strick, Producers – Michael Bay, Andrew Form & Brad Fuller, Photography – Jeff Cutter, Music – Steve Jablonsky, Visual Effects Supervisor – Marc Kolbe, Visual Effects – Digiscope & Pixomondo (Supervisor – Bjorn Mayer), Special Effects Supervisor – John D. Milinac, Prosthetic Effects – Andrew Clement, Production Design – Patrick Lumb. Production Company – Platinum Dunes/New Line Cinema. In a diner, Dean Russell abruptly slashes his own throat after not having slept for several days. A group of his friends from high school realise they are all having dreams about a sinister figure wearing a glove of steel claws. When the figure kills them in their dreams, each of them dies in the real world. As they desperately try to stay awake and stop themselves falling into dream, Nancy Holbrook learns that the dream figure is Freddy Krueger. She uncovers that Freddy was the janitor at their preschool when they were five years old. Believing that Freddy was molesting the children, their parents pursued and set him on fire. Though their parents have made every effort to cover this up, Freddy has now returned to take revenge against the children in their dreams. Freddy Krueger, the pizza-faced child molester with the steel clawed glove, was one of the least likely pop culture icons of the 1980s. The Freddy Krueger saga began with A Nightmare on Elm Street (1984), a genuinely eerie horror film from Wes Craven that starred Robert Englund as Freddy. From there, Freddy rose to become a cult figure and the most recognisable horror icon of the decade. New Line Cinema took over the rights to make a series of sequels:- A Nightmare on Elm Street Part II: Freddy’s Revenge (1985), A Nightmare on Elm Street III: The Dream Warriors (1987), A Nightmare on Elm Street IV: The Dream Master (1988), A Nightmare on Elm Street: The Dream Child (1989), Freddy’s Dead: The Final Nightmare (1991), Wes Craven’s New Nightmare (1994) and Freddy vs. Jason (2003), all starring Robert Englund. The first two films were serious but the tone was set by the third entry The Dream Warriors where the series was taken over by Freddy cracking bad jokes as he killed people and increasingly more absurd makeup effects set-pieces. Nevertheless, it was the success of the A Nightmare on Elm Street films that launched New Line Cinema from a B-budget studio to a major player able to back the Lord of the Rings films a decade later. By the 1990s however, the creativity of the Elm Street series was flagging and New Line kept trying to boost it with gimmicks – adding 3-D in Freddy’s Dead; with Wes Craven returning to conduct New Nightmare, the best of the Elm Street sequels, a fascinating meta-fictional entry that took place in the real world with the stars and production personnel of the series playing themselves; and bringing the A Nightmare on Elm Street and Friday the 13th series together in Freddy vs. Jason. In the 00s, there has been a huge boom in remakes of 1970s and 80s horror films. Here it is the turn of A Nightmare on Elm Street. The new A Nightmare on Elm Street joins a mountain of other remakes, including The Texas Chainsaw Massacre (2003), Toolbox Murders (2003), Willard (2003), Dawn of the Dead (2004), The Amityville Horror (2005), Assault on Precinct 13 (2005), The Fog (2005), Black Christmas (2006), The Hills Have Eyes (2006), The Omen (2006), Sisters (2006), When a Stranger Calls (2006), The Wicker Man (2006), Halloween (2007), The Hitcher (2007), April Fool’s Day (2008), Day of the Dead (2008), It’s Alive (2008), Long Weekend (2008), Prom Night (2008), Friday the 13th (2009), The Last House on the Left (2009), My Bloody Valentine (2009), Night of the Demons (2009), Sorority Row (2009), The Stepfather (2009), And Soon the Darkness (2010), The Crazies (2010), I Spit on Your Grave (2010), Mother’s Day (2010), Piranha (2010), Don’t Be Afraid of the Dark (2011), Fright Night (2011), Straw Dogs (2011), The Thing (2011), Maniac (2012), Carrie (2013), Evil Dead (2013), Patrick (2013), Poltergeist (2015), Suspiria (2018), Child’s Play (2019) and Pet Sematary (2019). In particular, A Nightmare on Elm Street comes from Platinum Dunes, the production company of director Michael Bay, which has been behind a number of these remakes, including The Texas Chainsaw Massacre, which started the fad off, and others such as The Amityville Horror, The Hitcher, Friday the 13th and Teenage Mutant Ninja Turtles (2014). Most of the Platinum Dunes remakes disappointingly fail to hold any kind of candle up to their predecessors – indeed, the same could be said for all of the abovementioned remakes. This new A Nightmare on Elm Street is no different. It is certainly a better-made film than some of Platinum Dunes’ others and does some things well. On the other hand, there is an overriding sense that it is unnecessary. There is nothing it does that improves or stands out over its predecessor; there is nothing here that a re-viewing of Wes Craven’s original could not have achieved far better. 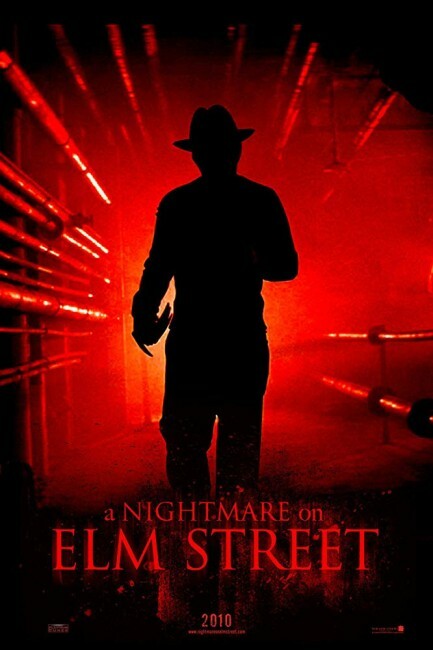 Certainly, there are some good things about A Nightmare on Elm Street 2010. One of these is the way the script treats the original. This come from Wesley Strick, a veteran writer who has penned screenplays for Arachnophobia (1990), Cape Fear (1991), Final Analysis (1992), Wolf (1994), The Saint (1997), The Glass House (2001), Doom (2005) and who directed The Tie That Binds (1995). Strick takes the time to explore the background of Freddy and the Elm Street children far more than the original or any of the sequels with extended flashbacks to what happened. The most intriguing aspect is when Strick invokes the controversial therapy of Repressed Memory Syndrome and its application to child abuse – even at one point suggesting that Freddy was an innocent who was hounded by angry parents who believed their children’s possibly untrue claims. Another worthy point is Jackie Earle Haley who does a commendable job of filling Robert Englund’s slouch hat. A minor supporting actor in the 1970s – he was the kid in The Bad News Bears films and Damnation Alley (1997) – who became a B-movie actor throughout the 1980s, Haley suddenly became a recognisable name and gravitated to the A-list slate after his turn as Rorschach in Watchmen (2009). 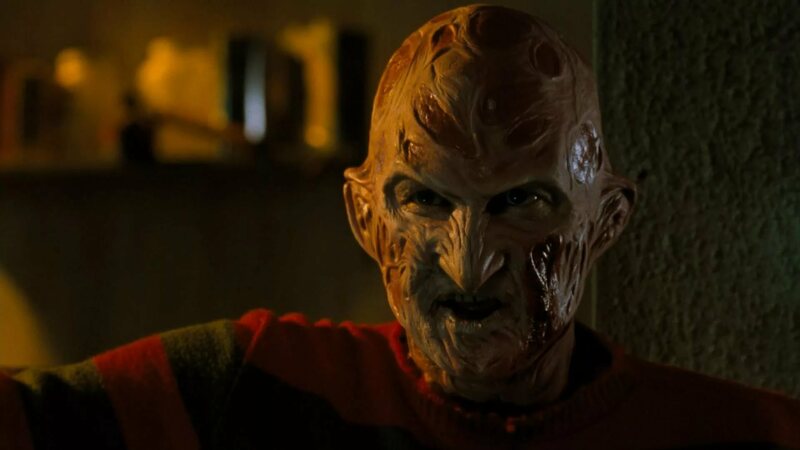 This Freddy certainly gets more dialogue than he did in the original film, which Haley delivers with a darkly laced glee. Here he also gets all the one-liners and quips one expects of a Freddy, even though these never came in until the third entry and were not technically part of the first film. On the other hand, while I cannot say that I ever liked Heather Langenkamp’s performance as Nancy in the original, Rooney Mara makes for an incredibly bland replacement here. The director is Samuel Bayer who has been making commercials and music videos ever since establishing himself with the video for the classic Nirvana song Smells Like Teen Spirit (1991). A Nightmare on Elm Street is his first film. Bayer revisits many of the classic set-pieces of the original – the girl being dragged around the ceiling as she is slashed to pieces; the claws appearing between Nancy’s legs as she dozes off in the bath; the wall bulging out with a face above someone as they sleep (needlessly replicated with CGI effects this time); the body in the bag being dragged through the hallways of the school. The one sequence that is notably missing is the one where Johnny Deep was sucked down into his waterbed and spat back out in a huge gusher of blood. There are a couple of new sequences but nothing memorable. Samuel Bayer replicates everything with a slickness but what is crucially missing is the eerie spookiness and outre weirdness that Wes Craven gave the original – the sense that we are in a twilight zone where the regular rules of reality have been taken away and literally anything can happen. It is not unakin to the remake of The Omen where the film traipses along dutifully replicating the original scene for scene, resulting in an over-familiarity that lapses into a slavish tedium while the very repetitiveness constrains the director and fails to allow him to open up and establish his own style. While Samuel Bayer does a reasonable job for the most part, there is nothing to the film that hits in in the way that made the original so electrifying to see for the first time. The sole moment that makes one start in their seat is one jump that Samuel Bayer gets off in the very last shot, even if it has largely been borrowed straight from the ending of Carrie (1976) and is a crude jump of no particular sophistication. Otherwise Wes Craven’s otherworldly eeriness has been watered down to no more than the generic mass-produced scares of every othercontemporary teen horror movie. Samuel Bayer subsequently returned to directing music video and had not made another film. The screenplay was one of the early works from Eric Heisserer who also wrote the remake of The Thing (2011), Final Destination 5 (2011), Lights Out (2016), Denis Villeneuve’s Arrival (2016) and Bird Box (2018).